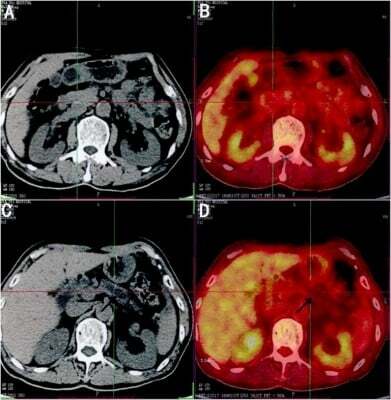 Objective: The current study was designed to analyze the value of 18F-FDG positron emission tomography/computed tomography (PET/CT) combined with carbohydrate antigen 19-9 (CA19-9) in differentiating pancreatic carcinoma (PC) from chronic mass-forming pancreatitis (CMFP) in Chinese elderly. Methods: As it is impossible to differentially diagnose PC from CMFP, 60 participants older than 65 years with focal pancreatic lesions were scanned by 18F-FDG PET/CT and their CA19-9 levels were tested. Diagnoses of all participants were confirmed by comprehensive methods including aspiration biopsy, surgical pathology, and clinical follow-up of 12 months. Twenty participants with CMFP were included in CMFP group and 40 participants with PC in PC group. Results: In CMFP and PC groups, 46 participants showed increased 18F-FDG uptake, 43 had elevated CA19-9 levels, and 38 participants had both increased 18F-FDG uptake and elevated CA19-9 levels. Standardized uptake value maximum of PC group (5.98±2.27) was significantly different from CMFP group (2.58±1.81, P<0.05). Sensitivity, specificity, and accuracy of 18F-FDG PET/CT in differentiating PC from CMFP were 95%, 60%, and 83.3%, respectively. CA19-9 levels of PC group (917.44±1,088.24) were significantly different from CMFP group (19.09±19.54, P<0.05). Sensitivity, specificity, and accuracy of CA19-9 levels in differentiating PC from CMFP were 87.5%, 60%, and 78.3%, respectively. Sensitivity, specificity, and accuracy of 18F-FDG PET/CT combined with CA19-9 levels in differentiating PC from CMFP were 90%, 90%, and 90%, respectively. Conclusion: 18F-FDG PET/CT had reliable sensitivity, specificity, and accuracy in differentiating PC from CMFP, and CA19-9 levels could be helpful in 18F-FDG PET/CT for differentiating PC from CMFP in Chinese elderly. Moreover, 18F-FDG PET/CT combined with CA19-9 levels was found to be an effective method to differentially diagnose PC from CMFP and has paved the way for the timely and safe treatment of PC and CMFP in Chinese elderly.